Though its viewership has been quite small, Manahattan has been renewed for a second season on WGN America. The period TV show’s first season finale airs this Sunday night. 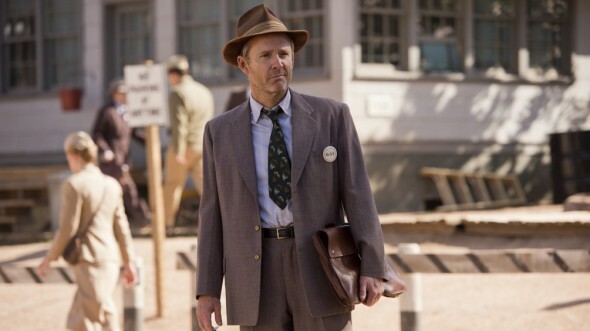 Set in 1943, Manhattan follows the residents of a secret town of Los Alamos, New Mexico. Hidden away by the federal government, scientists live there with their families while they work to build the world’s first atomic bomb. The cast includes John Benjamin Hickey, Olivia Williams, Alexia Fast, Ashley Zukerman, Rachel Brosnahan, Daniel Stern, Katja Herbers, Christopher Denham, Harry Lloyd, Michael Chernus, Eddie Shin, Daniel London, and Mark Moses. The 11 episodes that have aired so far have averaged a 0.08 rating in the 18-49 demographic with 420,000 viewers. The cable channel is still very new to producing their own scripted series so likely has low expectations at this point. What do you think? Do you like the Manhattan TV show? Do you plan to watch season two? I loved the first season and didn’t know it was back in October 2015, how do I get to watch the first episodes. 1) If you have Comcast as your cable provider, you can find it in its “On Demand” feature. Otherwise, check with your provider. 2) I don’t have HULU, but have read it is supposed to be on there. (IMHO, the first episode in Season 2 was a bit weird, but then settled back on track.